Are blacks still handicapped by racism? Many people believe the end of legal discrimination gave blacks the same chance of success as other Americans. And by any measure, African-Americans' social, economic and political standing has vastly improved since the civil rights upheavals of the 1950s and '60s. Yet, by all the same measures — wealth, income, life expectancy, school success, crime rates — blacks lag far behind whites. Many African-Americans — and not a few whites — say discrimination, whether due to institutional habits or deliberate prejudice, prevents them from attaining jobs and homes equal to those enjoyed by whites. 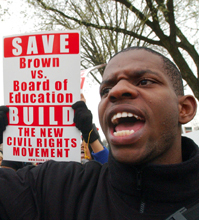 The recent Supreme Court decision upholding affirmative action heartened many blacks. But racially tinged incidents, such as those in Cincinnati, Benton Harbor, Mich., and Tulia, Texas, periodically shatter Americans' complacency about race. Apr. 14, 1989 Is Affirmative Action Still the Answer?